A line still forms outside the Father McKenna Center at St. Aloysius Church in Washington, D.C. People come to the cramped but homey church basement looking for food, clothing, housing and personal support. They still tell stories about Father McKenna, who died 25 years ago. To know the story of Father McKenna is to enter into the lives of the poor whom he loved as a father. “You can’t understand me if you don’t understand my people,” Horace liked to tell his friends as he brought them for a walk around the neighborhood. In his lifetime, as they do today, people freely called Father McKenna a “saint.” His father, Charles, had a sense of things to come. In his insightful biography, Horace: Priest of the Poor, John S. Monagan recounts how Charles insisted that his son be baptized with the name Horace. The priest protested: There is no St. Horace. “He’ll be the first,” Charles replied. Thus was Horace McKenna baptized in a New York City church in the winter of 1899. Horace was then assigned to teach at a high school for affluent boys in Manila, Philippines. Far removed from his comfortable upbringing and the insular world of studies, Horace felt his mind and heart stretched. He remembered particularly how an elderly Filipino Jesuit would regularly canvass the school playground for scraps of food left over by the privileged students. The brother would then bring the food over to the school wall, where hungry children anxiously waited for the delivery. According to Monagan, the Jesuit brother’s kindness and the children’s desperation made a lasting impression on Horace. When he returned to the United States to study theology at the Jesuit seminary in Woodstock, Md., not far from Baltimore, Horace taught Sunday school to African-American children who were not permitted to attend the segregated parochial school. Like his experience with the poor in Manila, his contact with those children transformed his understanding of his priesthood. After Horace was ordained in 1929, he asked his superiors to send him to work with African-American families suffering under segregation laws. With the blessing of his superiors, Father McKenna made his way to southern Maryland, where for over 20 years he served as a pastor. Horace thrived in his sacramental and pastoral duties, traveling around southern Maryland in his old car. Walter Burg-hardt, S.J., then a young priest, recalls driving with Horace and stopping frequently so that Horace could say hello to people along the way, usually addressing them by their last name as a sign of respect. During the Great Depression, Horace set up a food distribution system and over the years provided assistance to struggling farmers. Inspired by other Jesuit trailblazers like John LaFarge and Richard McSorley, who worked in southern Maryland at one time or another, Horace vigorously advocated for racial integration in churches and schools. 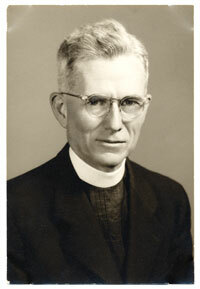 As racial tensions continued to flare, Father McKenna was transferred in 1953 from his beloved southern Maryland to St. Aloysius Church in the District of Columbia. Except for a six-year stint at a parish in Philadelphia, Horace would spend the rest of his life ministering just blocks from the U.S. Capitol. “It’s the same work,” he said, “chasing sheep; except that the ground is harder.” The St. Vincent de Paul Society office in the basement of the church became a center for Horace’s charitable work. Horace’s work was ecumenical at its core: he partnered with other churches and served anyone in need, regardless of their religion. In 1970, with the help of friends at Georgetown and other religious leaders, Horace founded S.O.M.E. (So Others Might Eat), an organization that provided hot meals to the hungry not far from St. Al’s. Horace was an avid fundraiser and communicated news of his work to well-connected friends along the East Coast. He tried to educate the privileged about the plight of the poor. Accolades and honorary degrees came his way. He courted politicians in the name of the poor. With his charming personality, simplicity of lifestyle and selfless zeal, Horace easily won over benefactors. In the late 1960s and 70s, marches and protests were common in the District of Columbia. Horace walked down to the mall and befriended the protesters. He marched against the Vietnam War. By the end of his life, as the nuclear arms race continued unabated, Father McKenna described himself as a pacifist. Horace’s most difficult time as a priest came in 1968, after Pope Paul VI issued his encyclical Humanae Vitae. He publicly dissented from the archbishop of Washington, Cardinal O’Boyle, who had issued guidelines for priests to apply the teaching prohibiting the use of artificial birth control. Horace, who had great personal affection for the cardinal, joined a group of priests in protesting a literal application of the encyclical. Relying on more than 40 years experience hearing confessions, Horace argued for some pastoral accommodation for married couples who as a matter of conscience found the teaching unduly burdensome. Because of this dissent, Cardinal O’Boyle, who had equal esteem for Horace, restricted him from hearing confessions. Being kept from the “peace box” pained Horace deeply. After two-and-a-half years of canonical appeals and personal pleas, Horace and other dissenting priests expressed assent to a series of statements of doctrine, after which O’Boyle restored their faculties to hear confessions. As he approached his 80th birthday, Horace encountered physical limits to his once boundless activity. Though his mind remained sharp, he started to lose his sight and needed help getting around. Talk of his saintly character grew. When Washingtonian magazine named Horace a “Washingtonian of the year,” the editors commented, “He is said to be the closest thing we have to a saint.” Mayor Barry of Washington, D.C., declared July 15, 1979, “Horace McKenna Day” and named him “Apostle of the Poor.” Governor Hughes of Maryland awarded Horace a special citation for his service in southern Maryland. He was given his fourth honorary degree, this time by Fordham University. Of his many honors, Horace treasured most of all the celebration of his 50th anniversary as a priest, hosted by his Jesuit brothers. When God lets me into heaven, I think I’ll ask to go off in a corner somewhere for half an hour and sit down and cry because the strain is off, the work is done, and I haven’t been unfaithful or disloyal, all these needs that I have known are in the hands of Providence and I don’t have to worry any longer who’s at the door, whose breadbox is empty, whose baby is sick, whose house is shaken and discouraged, and whose children can’t read. The Church of St. Aloysius was packed for Horace’s funeral: rich and poor, black and white, men and women from all walks of life. He was laid to rest in the Jesuit cemetery on the Georgetown University campus, buried in a simple coffin, befitting both his lifelong vow of poverty and his faithful accompaniment of the poor. Kevin Gillespie, S.J., recalls an encounter with Horace one cold winter night just months before he died. Kevin was a young Jesuit teaching at Gonzaga High School. Father McKenna, partially blind and using a cane, asked Kevin to drive him to a homeless shelter. “I want to be where Jesus is tonight,” Horace explained. Arriving at the shelter, a group of men came out to greet them. Kevin helped Horace get out of the car and entrusted him to the arms of the men of the street who loved him as a father. They carefully led Horace into the shelter, the door shutting behind them. Their saint had come home to them one last time. One testament to a saintly life is the vigor with which the holy person’s work is carried on. On the first anniversary of Horace’s death, Archbishop James Hickey of Washington, D.C., dedicated the newly renovated basement of St. Al’s in honor of Horace. The Father McKenna Center has since expanded to include a small shelter for men. S.O.M.E. now offers food, clothing, health care, job training and housing to thousands of people each year. Sursum Corda continues to operate, but its future as publicly supported housing is precarious. Horace’s old neighborhood is changing rapidly. The gentrification of the area and development of more office buildings have further squeezed poorer families out of the neighborhood. A single-minded focus characterizes those special people we call “saints.” For Horace, the focus was always the poor and powerless. In them, he glimpsed the face of Christ; in them, he always found a home. This article also appeared in print, under the headline "Horace McKenna, Apostle of the Poor," in the September 17, 2007 issue. Kevin O’Brien, S.J., is an associate pastor of Holy Trinity Catholic Church in Washington, D.C.